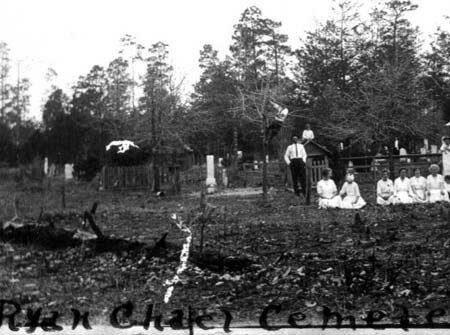 Ryan Chapel Cemetery, which is located behind the Ryan Chapel Methodist Church, is one of the oldest cemeteries in the Burke area and is the final resting place for many Burke area pioneers. The first person buried there was William Lee Fairchild, son of John Jackson Fairchild and Martha Ann Weeks Fairchild. In 1868 William was at a syrup mill near Ryan Chapel Church where a horse was walking in a circle powering the cane squeezer. A bee attracted by the cane sap stung the horse causing him to kick at the bee. Young Williamwas too near the horse and was struck by the horse's hoof. Sixteen year old Mary Jane Johnson, daughter of Patrick and Vianna Ashworth Johnson, ran to his rescue but was unable to help him as he expired in her arms. At the time there was only a church and school at Ryan Chapel and no cemetery. The cemetery that the Fairchilds would normally have used was some distance away and inaccessible due to high water. The family was granted permission to bury William behind Ryan Chapel Church. unknown date. (Note the man in the tree). On the first Sunday of each June, Ryan Chapel holds a Homecoming for everyone associated with the church or cemetery. Shortly before the big Sunday before the cemetery was professionally maintained, families would groom their family burial plots and decorate the graves with flowers. Before lawn mowers became common, the plots would be cleared of grass and weeds with a hoe and raked as the older residents groomed their own yards at home. The morning was filled with church services and congregational singing of old Methodist hymns in the sanctuary. Those outside visited with long absent relatives and former neighbors who had moved away to Houston and other places. Eunice Fay Spears would always be sitting at a table under a tree beside the church accepting contributions for the Cemetery Association. Under the huge pines the Coca Cola distributor from Lufkin would set up a concession trailer and sell cold sodas to the hot, thirsty little boys like the author and other congregants. Table for "dinner on the grounds"
The reason for selecting the first Sunday in June as the date of the Homecoming is not known, but it might have been determined by history. The national holiday known as Memorial Day was observed on the 30th of May until Congress changed the date to the last Monday in May. Memorial Day was originally intended to honor fallen Union Soldiers, although ironically it was patterned on similar observances for fallen Confederate soldiers in the South. Due to continued hard feelings in the South about the Civil War, Southern states observed Confederate Memorial Day on dates which varied by state. Some Southern states, though not Texas, observed Confederate Memorial Day to coincide with Jefferson Davis' birthday on either June 3 or 4. Perhaps Ryan Chapel Homecoming arose from Confederate Memorial Day and the may have been chosen to be on a Sunday nearest Jefferson Davis' birthday. At noon everyone spread their tablecloths and food on a long table beside the church and after grace was said shared "dinner on the grounds." Families had favorite spots on the table that they used year after year. In the 1950's C. B. Fairchild, whose family had the first burial in the cemetery, appropriately always spread dinner at the end of the table nearest the cemetery. He always backed his flat bed truck near the table. The table would be filled with fried chicken, chicken and dumplings, chicken and dressing, deviled eggs, peas of all varieties, butterbeans, corn, squash, homemade pies, and other delicious East Texas rural fare.